The Kirtland’s Warbler isn’t Michigan’s State Bird, but in the hearts and minds of many state residents, it is just that. Once living on the brink of extinction, the Kirtland’s Warbler has taken significant steps toward recovery, though it remains on State and Federal Endangered Species lists. A few counties in the northern Lower Peninsula represent its primary nesting area, but in recent years nesting pairs have been recorded in Michigan’s Upper Peninsula, Wisconsin, and Ontario. Michigan Audubon employs a seasonal guide to lead Kirtland’s Warbler tours from Grayling, MI, working in conjunction with the Michigan Department of Natural Resources and the U.S. Fish and Wildlife Service. The tours are based at Hartwick Pines State Park just north of downtown Grayling. Tours cost $10 per person (13 and younger are free) and you must have a Recreation Pass to enter the State Park. Tours will begin Monday, May 27 and are scheduled daily at 7:00 a.m. On Saturdays and Sundays, there will also be tours at 11:00 a.m. The last day tours will be offered is Saturday, June 30, 2019. Tours will meet at the Michigan Forest Visitor Center within Hartwick Pines State Park, where participants are given a brief orientation to the Kirtland’s Warbler and the Jack Pine habitat. Afterward, participants caravan to protected pine barrens for the chance to view the endangered warbler. Reservations are only accepted for groups of more than 5 individuals. If you have more than 10 people in your party, you may be required to participate in the 11:00 a.m. tour and we will arrange a special tour if you are attending during the week. Groups smaller than 5, need only to arrive at the visitors center in time for the tour. There is no tour capacity, thus all those who arrive on time will be included in the tour. To make group reservations, please email events@michiganaudubon.org. If you are a Michigan resident and do not have a Recreation Pass, you will be required to purchase one. A Recreation Passport can be purchased the day of your tour. Those arriving for the 7:00 a.m. tour will be able to purchase their pass, if needed, from the tour guide at the Visitor Center. Those arriving for a later tour can purchase the passport at the Park’s entrance booth. The entrance to Hartwick Pines State Park and the Michigan Forest Visitor Center is located on Hartwick Pines Road (aka M-93) just east of I-75. There is an approximate walk of 5 minutes up an inclined walkway to reach the visitor center from the parking lot. A map and detailed information regarding Hartwick Pines can be found on the Michigan DNR Website. Tour duration: 2.5 to 3 hours. We have a high success rate of seeing the Kirtland’s Warbler. Weather plays an important role in seeing the bird, as they tend to stay down in the pine branches during inclement weather and severe heat. Our guides have even been able to locate the bird during inclement weather, so don’t cancel your plans because the sun isn’t shining. Please be advised that you will park along the road and walk into the Jack Pine habitat on sand trails. Walking distance is usually less than one mile. The distance of foot travel will depend on where in the Jack Pine the birds establish their territory for the nesting season. Please dress for weather conditions and wear good walking shoes or boots. You will be outside for approximately 2 hours so having sunscreen, insect repellent, and a hat are always recommended. Out of respect for the bird and its well being our guide will not make special accommodations for professional photographers. Looking for accommodations for the night in Grayling? There are many small motels and two chain hotels to fit your needs. Check the Grayling Visitor’s Bureau for information. 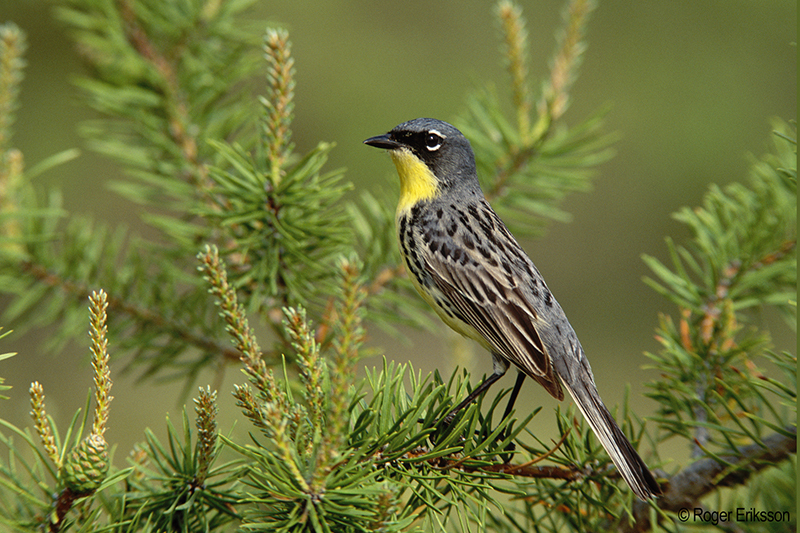 For additional information regarding Kirtland’s Warbler tours, email events@michiganaudubon.org. Learn about other locations for seeing the Kirtland’s Warbler!